Crafting – Mosaics for Kids! Mosaic is a technique of taking small pieces of stone, glass or other types of material and arranging them into a pattern or picture. The small pieces are usually square but can be other shapes in order to make a picture as aesthetically pleasing as possible. 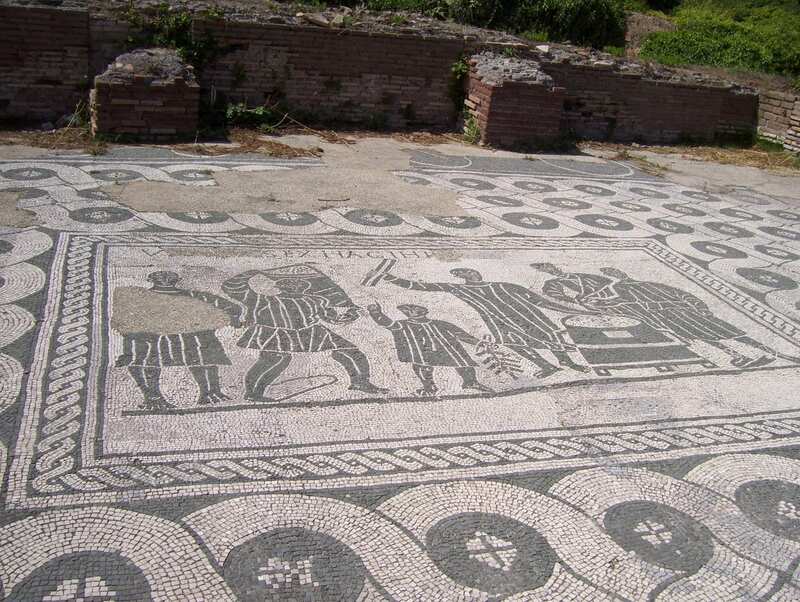 Mosaics were common in Roman and Greek cultures, and were used to decorate homes, places of worship and other gathering places such as gyms. On trips to Italy and Greece I saw a number of beautifully detailed mosaics depicting animals and customs of the time. A few examples of mosaics I found interesting on my travels are below. 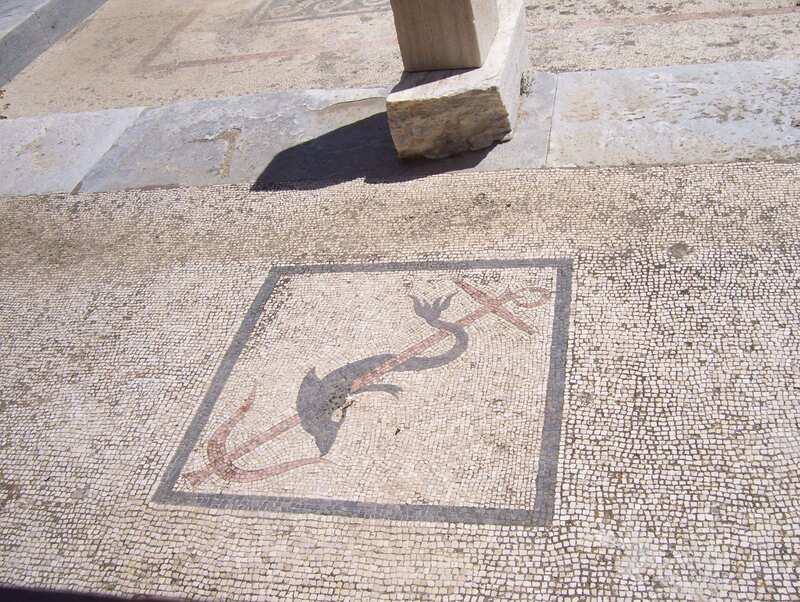 This mosaic in Greece depicts a sea creature that looks similar to a dolphin, surrounded by plain mosaics. This mosaic in Italy shows a market scene because it was located in an ancient market square. Men buying and selling goods are depicted in the mosaic. 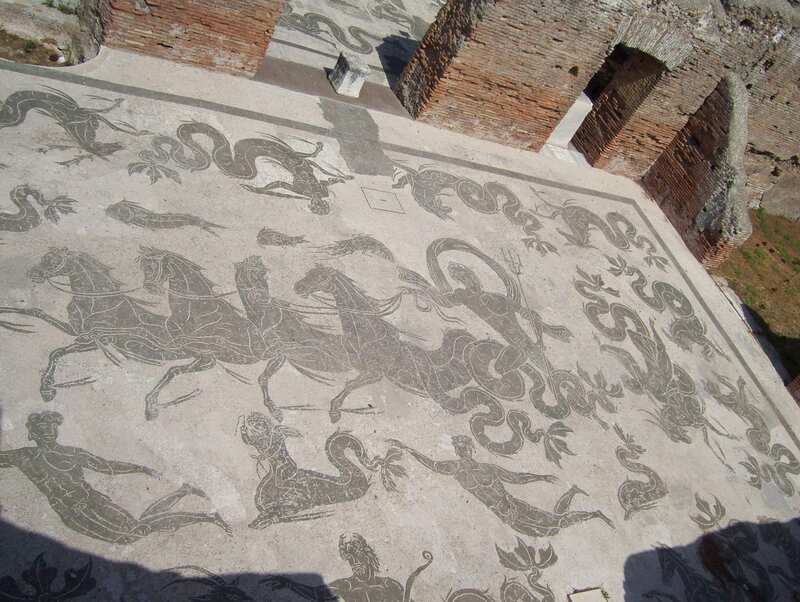 This last mosaic in Italy shows a very detailed horse drawn carriage surrounded by sea creatures. It’s an impressive scene with lots of movement. Inspired by these mosaics, I’ve created some simple and quick mosaic crafts that you can make with your children. We won’t be making any mosaics as detailed or large as the ancient one’s, but will be making three different types, from Level 1, really quick and easy, up to Level 3, which takes more time and a little bit more skill. Level 1 of the Mosaic craft only requires arranging the mosaic squares in a straight pattern. This craft will only take about 15 minutes to complete. 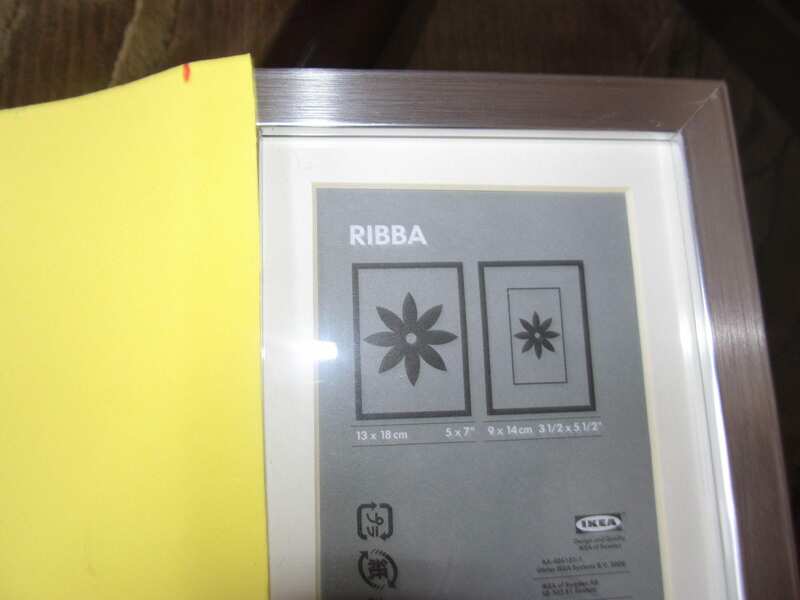 Choose which colours of foam you would like to decorate the frame with and cut two long strips of foam. Cut the strips of foam into small squares of a few centimetres in width. 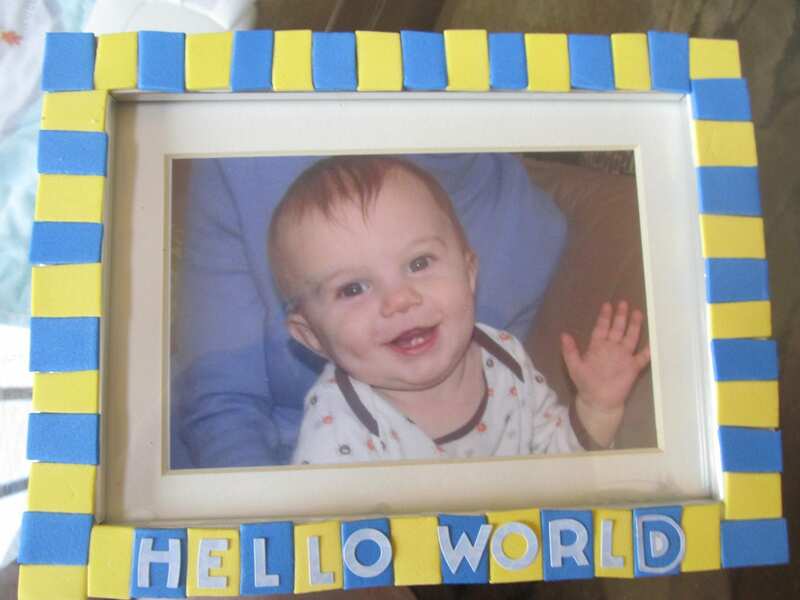 Put glue around the frame and glue the small foam squares, alternating the colours in whatever patterns you wish. Level 2 of the Mosaic craft requires more effort because you have to arrange the squares into letters, which is more difficult than arranging them in straight lines. 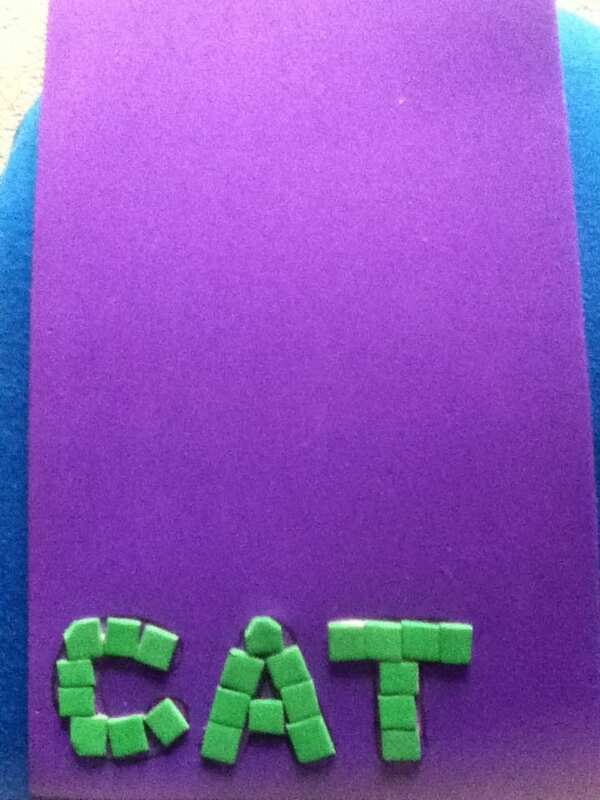 Taking the stencil, outline the letters of the word or phrase you would like to arrange a mosaic around. 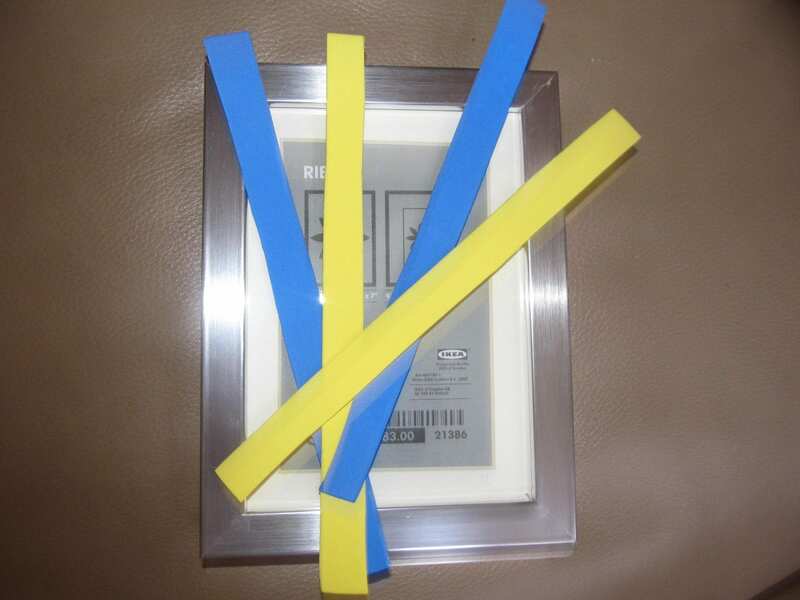 Cut the foam into long, thin strips and then cut the strips into small squares. 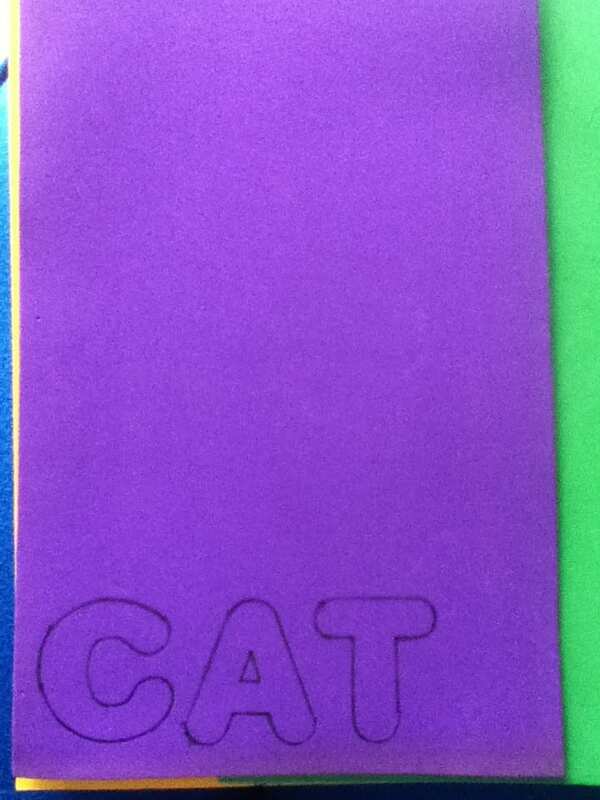 Put the glue inside the letter stencils. Arrange the small squares around the stenciled letters in the pattern you would like, eg. green square, yellow square, green square. 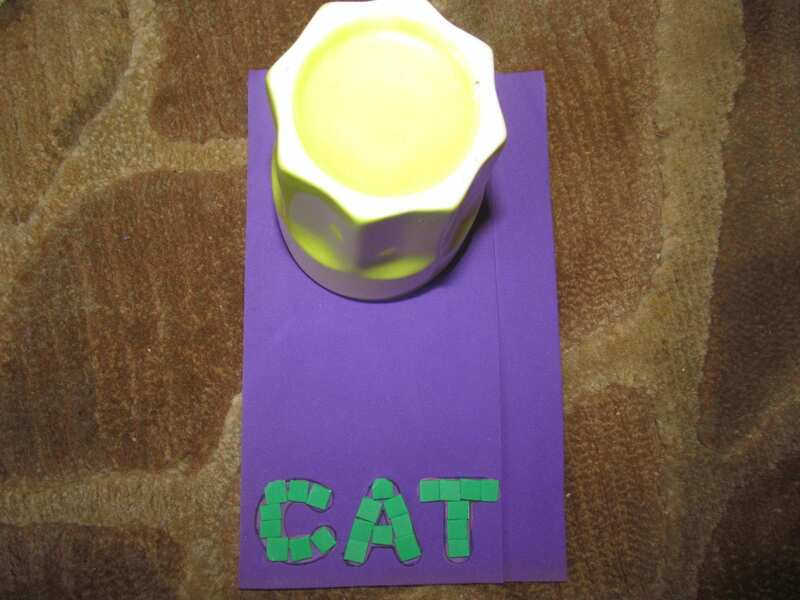 To make the foam piece a door hanger take a small cup with a diameter smaller than the width of the foam piece. Trace the circle of the cup and then cut it out. 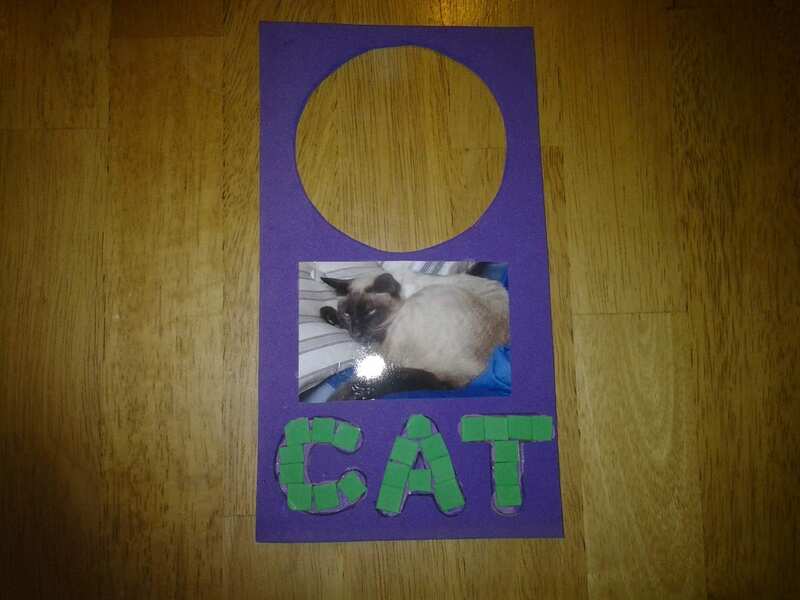 Add a photo of whatever you wish to personalize the door hanger, eg. your cat! 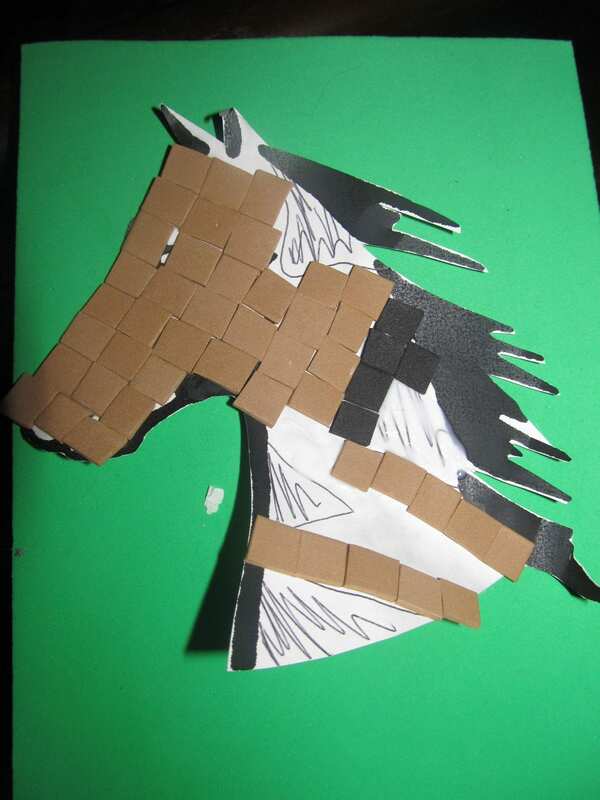 Level 3 of the Mosaic craft requires more time and effort because you are arranging the mosaic squares around irregular shapes, in this case a horse figure. 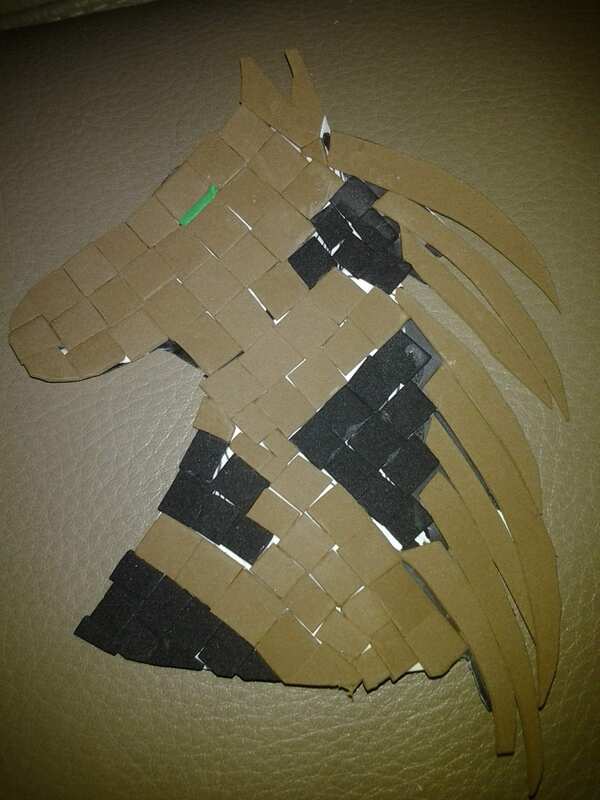 You can find many figures to use for this project on the internet by typing, “horse stencil” for example. 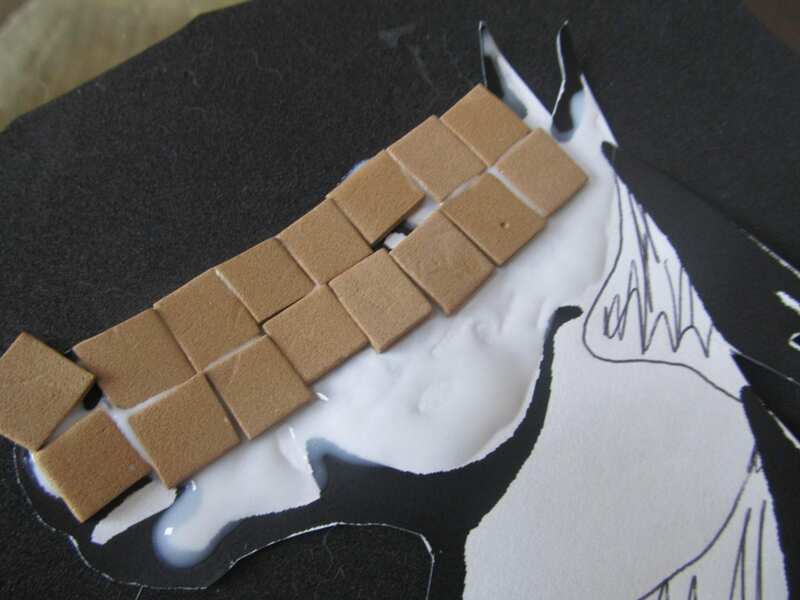 Another idea for finding figures to make into mosaics is using cookie cutters and tracing them onto the foam piece! 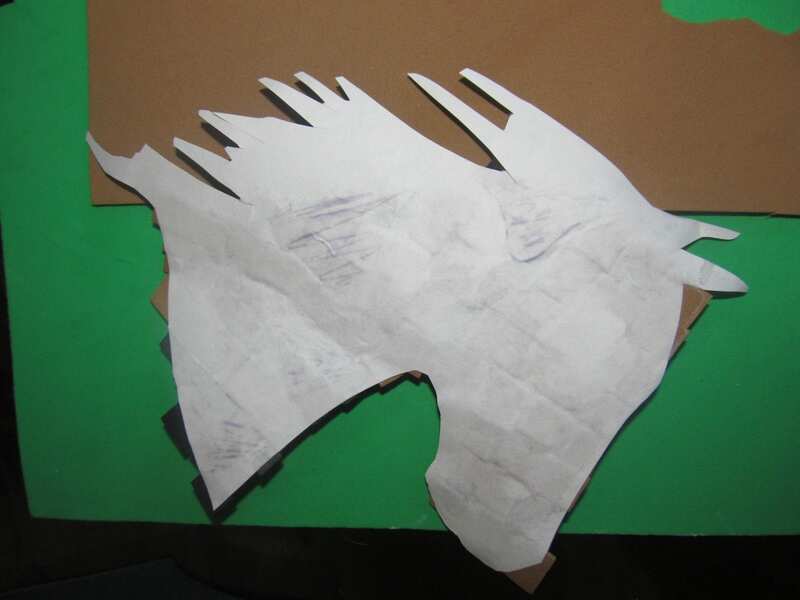 Taking the horse stencil, outline the figure on the foam with pen. Cut thin strips of the colour you want the figure to be. Next cut the strips into small squares. Arrange the squares along the curves of the figure in one line after another until the figure it filled. If you want to add more detail, add a second colour like in the example. When finished arranging the squares turn over the figure and trim any sections that are outside of the lines of the original figure. You can use this figure on a card or a door hanger or in a scrapbook, etc. As with any arts and crafts, have fun with the original ideas covered here! Dream up and design whatever you would like to be illustrated through mosaics! love the horse ones, they look great, would be great for my friends summer horseback riding camp, thanks! Let us know how you liked making them! We tried a few something simple they were not keepers lol when they get a bit older we will try again.I t was fun! Those are all great craft ideas, thank you for sharing.